The system improves quality of care, eases physical demands on caregivers, and reduces caregivers’ dependence. The new hoist system at the Red Cross Home for the Disabled. 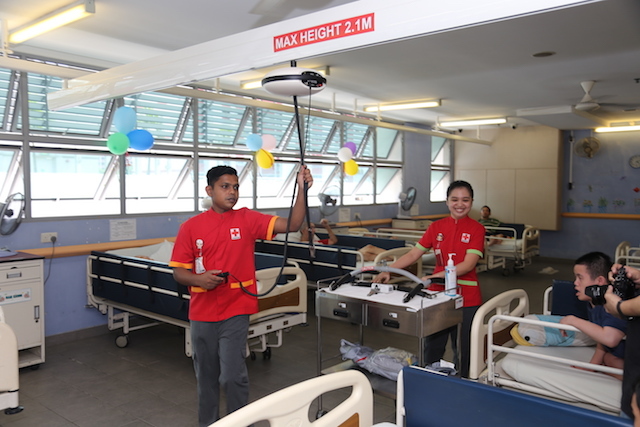 Singapore Red Cross unveiled a mechanical hoist solution at the Red Cross Home for the Disabled (RCHD), Singapore’s only residential home for the severely disabled. RCHD is the first such home in Singapore to be installed with a ceiling hoist system. With direct connection to the bath area, the hoist enables caregivers to safely move residents including elderly and disabled young people to get to the bathroom and around the ward easily. Costing about S$130,000, the hoist solution is fully funded by donations raised at a charity dinner in November 2017 organised by The Portcullis Group and Fusang, in conjunction with its 10thyear of CSR relations with Singapore Red Cross. With safety being its key feature, the hoist system comprises a lifter and rail track mounted on the ceiling, to lift and move persons with mobility challenges. Intuitive and effortless to operate, the hoist is so effective that a single caregiver can move a resident without assistance from other staff, freeing RCHD’s nursing aides to concentrate on their other duties. Without the system, it would take up to four nursing aides to safely lift one resident from his or her bed for daily activities, and the nursing aides would have to carry 100 residents, not once but several times a day. The system allows a single caregiver to move a resident without assistance from other staff. The European-designed ceiling track system measures 30 to 35m in length, and the lifter is designed for heavy lifting with capacities of up to 200kg. Unlike the linear movements of most automated hoist systems, RCHD’s manually-operated hoist solution enables sideways and complex navigation, allowing caretakers to manoeuvre residents to locations quickly, facilitating rapid response. The sturdy design also enables fuss-free cleaning and preventive care. Sections of the system can be easily dismantled for maintenance and a backup unit can be installed to eliminate downtime. RCHD Staff Nurse Cherilyn Austria Imson shared, “A person with multiple disabilities is unable to control his movements to accommodate us. The new ceiling hoist solution greatly improves productivity – now, just one nurse can manage the lifting and moving work – a drastic improvement from needing four aides previously! We are very happy to be able to deliver better care and service to our charges at a home away from home.” The hoist system is widely used in nursing homes around Europe.